Cycling from the heart of the island to the charming island of Ortigia, among baroque architectures of rare beauty, gaudy ceramics, ancient autocton vines and tasty foods. A concentrate of stories, races and cultures that will touch your heart. We meet at the airport of Catania and, after about an hour of transfer, we reach the elegant Villa Trigona, immersed in the heart of the Sicilian countryside. After the bike fitting, we go out for a short bike ride to discover the enchanting mosaics of Villa Romana del Casale. Before dinner, accompanied by the landlord Emanuel, last heir of the aristocratic family Trigona, we present the main wines of Sicily, as well as telling you about the beautiful journey that awaits us, of course. We leave the lush gardens and orchards of Piazza Armerina to move the most typical landscapes of the interior of Sicily, made of bare hills drawn by fields and dry stone walls. For lunch we stop in the beautiful old town of Caltagirone where we visit the workshop of a local potter, in addition to making a stop on the wonderful staircase of Santa Maria del Monte. In the afternoon we continue through the countryside of Caltagirone where we spend the night in a cozy rural residence. In the first part of the day we cross olive groves and vineyards as far as the eye can see, along of a rolling route. After lunch we begin the ascent to the Ibleo plateau through the characteristic white limestone walls, with breathtaking landscapes on the surrounding valley. 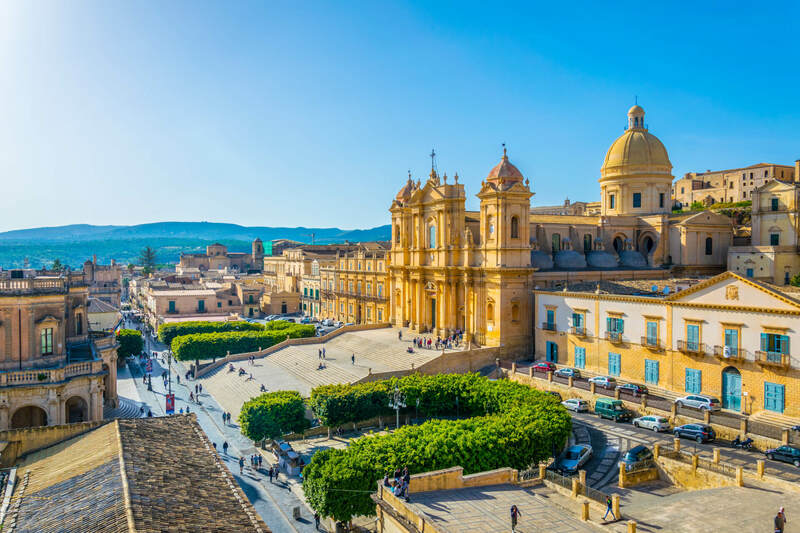 The stage ends in one of the most magical places in Sicily: Ragusa Ibla, a marvelous monumental city known throughout the world, as well as for its beauty, for the quality of its gastronomy, awarded with three starred restaurants. Today we allow ourselves an easier day, both to have more time to devote to the beauties of Ragusa, than to go to discover Modica, another casket of south-eastern Sicily, where we will taste the famous chocolate (ciucculatta muricana) still made according to the ancient Atzeca recipe, imported from the Spaniards in the Modica County in the 16th century. Today the most demanding day of the tour awaits us, with a new ascent of the Iblei mountains. The countryside is one of the most beautiful in Sicily, and to admire it at best we stop for lunch on the beautiful terrace of a farmhouse overlooking the valley. After lunch we wait for the second ascent of the day to the ancient village of Palazzolo Acreide, which we leave along a quick descent to reach the elegant country house that will host us for the night. 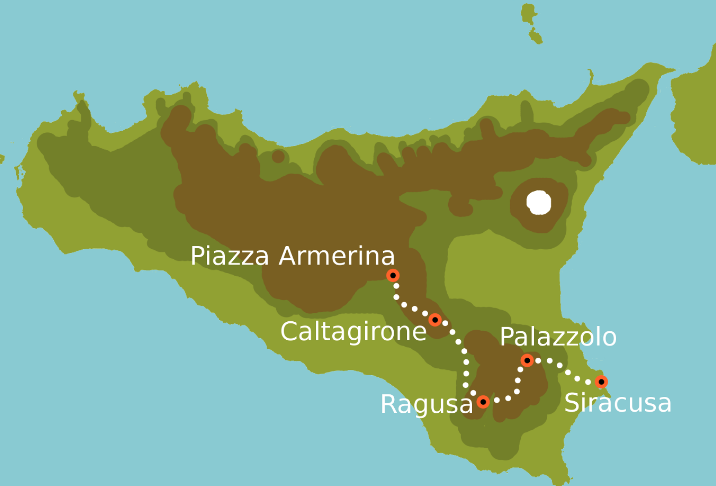 A long and gradual descent from the hills to the citrus orchards of Siracusa countryside, up to the sea bastions on the island of Ortigia, an ancient Greek settlement that gave rise to the most powerful Greek colony in the Mediterranean. Ortigia, in just a square kilometer of extension, brings together a number of impressive buildings and monuments, among which stands out the wonderful Cathedral of Syracuse (Cathedral of the Nativity of Mary Most Holy), a building of rare interest because it incorporates the ancient Temple of Athena, the Doric columns along the walls that close the side aisles of the church are well recognizable. An aperitif on the ancient walls, in front of the sunset over the sea, and a dinner in one of the best restaurants in town, will close the day and our fantastic tour through south-western Sicily. Sadly today we leave, but we are sure that we will meet again on the roads of the Mediterranean! The price of this Tour starts from 1.800 €, and it's fully customizable.